Look and Feel This lampshade has a cornered outside and a curved inside. The curved inside is quite unexpected. Just like the first time you open a chestnut and see that it is very round and curved on the inside. The proportions of the Chestnut lamp are based on natural geometry to create an interesting shape that at the same time creates a sense of harmony. Functionality The paper filters the cold light of energy-saving bulbs or LED bulbs to give the light in any room or space a cosy, warm ambiance that feels very natural. The strong folds and curved folds on the inside play with the light. The lampshade fits around a standard energy-saving lightbulb. The lamp is lightweight and can be installed in a very short time. Production This lampshade is folded with utmost precision out of special FSC paper of the type Butterfly. The folds are pressed in the paper by die cutting. When to use? The Studio Snowpuppe lamps are very suitable for use in a home or in public spaces like libraries or hotel rooms. The lamps are often used in clean spaces that need some bright eye-catchers that give the space a warm ambiance. Mission Our goal is to make you happy and to inspire you in your creativity by experiencing the cosy light of our lampshades. For us creativity is adventure and the discovery of new things, whatever these things might be. We hope to make you smile and brighten up your living. ____ Made by hand in Holland Material The shade is made of 1 piece of FSC paper of the type Butterfly. Electrical cable: cotton cord Dimensions Height: 18 cm - 7 inch Diameter: 28 cm - 11 inch Weight: 326 gram Available colors: White, Canary yellow, Autumn yellow, Gold yellow, Autumn green, Mint green, Pink, Brown, Grey Certificates CE, FSC ____ The Chestnut lamp is also available in birch wood veneer. 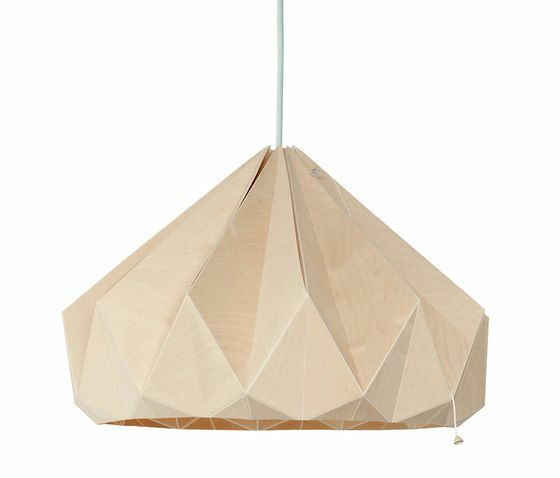 Dimensions Height: 30 cm - 11.7 inch Diameter: 47 cm - 18.3 inch Material This lampshade is made from 1 piece of birch wood veneer, that is glued to a large sheet of paper. The wood veneer is milled away to create a folding line. After the milling, all the folding lines are sanded by hand. Finally, the lampshade is folded. The light is shining through the veneer, which makes the structure of the veneer visible. At the folds, more light is shining through, which gives a very special effect. Company Philosophy Studio Snowpuppe - lights to inspire The story behind Studio Snowpuppe’s lampshades is about the fascination of paper and light.